Penn State Extension Philadelphia Master Gardeners : Pennypack Park Philadelphia……Volunteer day. Pennypack Environmental Center in NE Philadelphia was the site of a recent volunteer opportunity. Two gardens needed tending, as the center is short staffed and relies on volunteers for these types of projects. The rain garden, which fortunately was already graded, was cleared and new plants were added to the very lonely but thriving cardinal flowers. Master Gardeners suggested the addition of Cinnamon fern, swamp milkweed, turtlehead, and lobelia as suitable plants for the site. The most interesting was the Demonstration Garden that is used as a scented garden for visitors, public programs, and groups of children from schools and camps. The purpose of this garden is to have useful plants, especially ones that have a sensory impact. 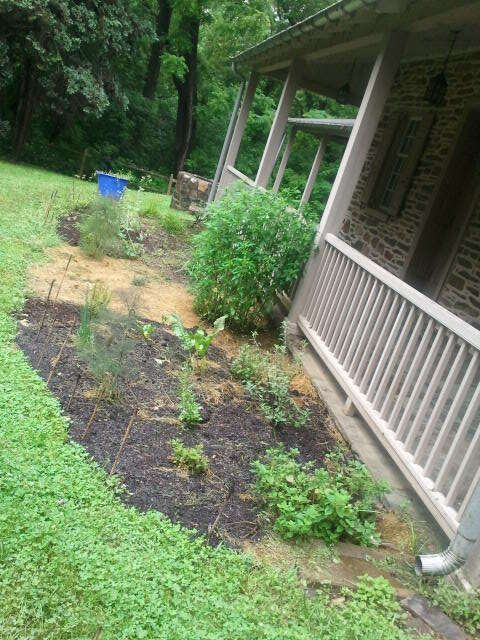 There are several lemon scented plants (verbena, lemon grass, lemon balm) as well as mints (bee balm, peppermint, spearmint) and kitchen herbs, several of which (the sage, rosemary, and basil) had to be replaced. Some of the more unusual additions are cotton and stevia, which is very sweet, and horseradish. We also added some scented geranium, lavender, and lamb's ear. The Center also put in a brand new downspout planter which directs rain off the roof and into a large planter. A variety of native grasses and stiff goldenrod were added to the planter.